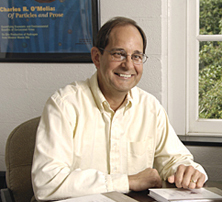 Edward J. Bouwer, the Abel Wolman Professor of Environmental Engineering, has extensive experience with drinking water and wastewater treatment processes, microbial process engineering, and contaminant transport and fate. He is director of the Center for Contaminant Transport, Fate, and Remediation, established to study the effects of contamination in Maryland’s urban environments and make these findings known and understood by public officials, groups and the media. Bouwer previously chaired the Department of Geography and Environmental Engineering. Bouwer’s research provides guidance on defining and managing environmental risks and how to interpret human and ecological health risk data. His interests encompass factors that influence biotransformation of contaminants; bioremediation for control of contaminated soils and groundwaters; biofilm kinetics; biological processes design in wastewater, industrial, and drinking water treatment; anaerobic digestion of wastes to recover energy as methane; algal biofuels; transport and fate of microorganisms in porous media; behavior of metals in contaminated sediments; and defining and managing environmental risks. He coauthored the book The Illusion of Certainty: Health Benefits and Risks, which explains the principles of calculating basic epidemiologic risk estimates and offers a way of delivering health information by an easy-to-understand graphic. The book puts the complexities of risk analysis in terms general readers can identify with, empowering them to make well-informed decisions. Bouwer has served on several National Academies committees that provide guidance on managing human and ecological risks to Congress, regulatory agencies and the scientific community. He serves as editor-in-chief for the journal Biodegradation and on the editorial boards for the Journal of Contaminant Hydrology and Environmental Engineering Science. He is a member of numerous professional organizations, including the Association of Environmental Engineering and Science Professors, the American Society of Civil Engineers, the National Ground Water Association, the International Water Association, the American Water Works Association and the American Academy of Environmental Engineers and Scientists. Bouwer received his bachelor’s degree in civil engineering from the University of Arizona in 1977, and a master’s degree and PhD in environmental engineering and science from Stanford University in 1978 and 1982, respectively. He completed a research advisorship at the National Institute for Water Supply in the Netherlands and worked as an assistant professor of civil engineering at the University of Houston before joining the Whiting School of Engineering faculty in 1985.